When you were a kid, everything you encountered was novel and filled you with a sense of wonder. You were an explorer. An inventor. A scientist. A gamer. An astronaut. Now, you’re solving problems with technology and the curious mind you’ve always had. #AzureTrivia wants to celebrate the curiosity that keeps you so inspired. Join us, have some fun and show off your whip-smart Azure knowledge—bragging rights are on the line. Every Monday @Azure will tweet out an Azure-related question. Want to test your Azure acumen and win* something cool? 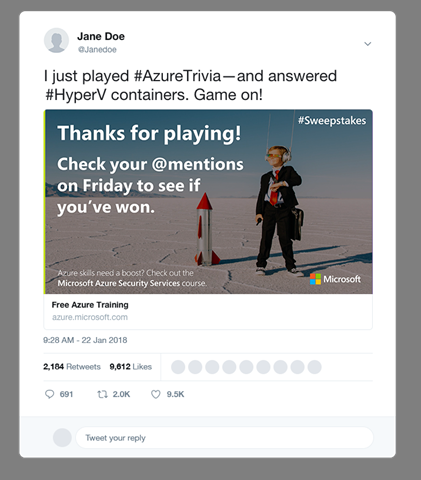 Just click on your selected answer, and if you tweet the correct answer no later than Thursday using the handy tweet we wrote for you (be sure to keep #AzureTrivia and the image), you’ll be entered to win a weekly prize (cool swag and other goodies). Pro tip: Be sure to come back every week for a brand-new question and another chance to win. 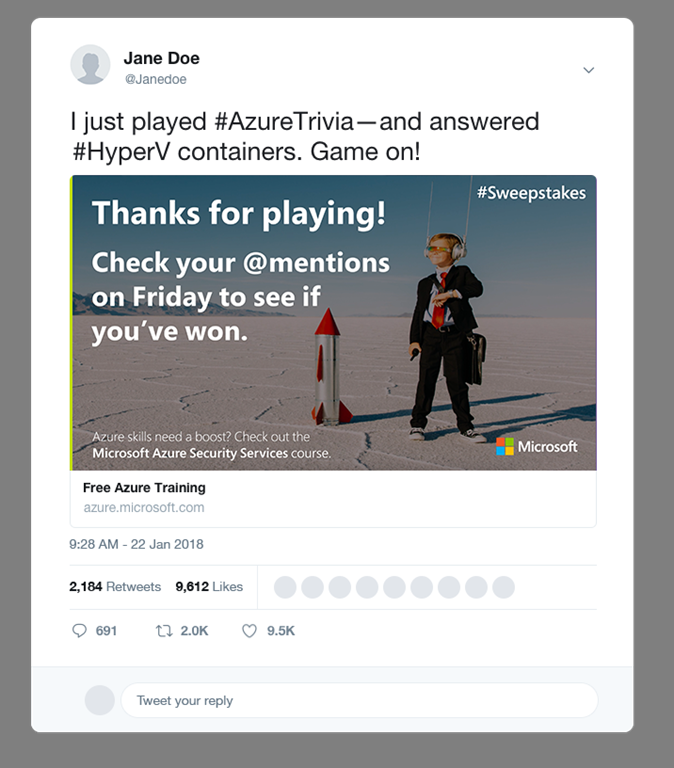 If you love playing #AzureTrivia and want a competitive edge, check out these free Azure learning resources and get your win on! Sample entry tweet including auto-generated confirmation message and image. You could win some sweet #AzureTrivia Champion swag and other goodies, including an exclusive #AzureTrivia Champion T-shirt, Ember mug, and more. *No Purchase Necessary. Game ends 6/22/18. For full details, see the Official Rules.